instant delight . . .
We're bringing the show back! 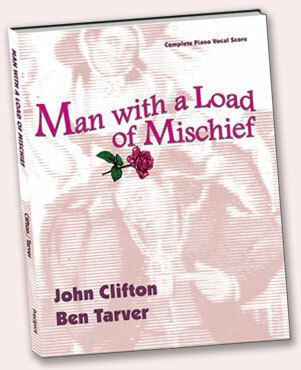 MAN WITH A LOAD OF MISCHIEF was an off-Broadway success in 1966/67, then played London's West End in 1968/69. For nearly forty years it has been staged in various theatres, indeed has been done around the globe, mostly in English-speaking countries. It has been revived three times in New York, most recently in a 'concert production' at the York Theatre, in the fall of 2012. It has proven to have a timeless charm and continuing relevance, a loyal following too large to be merely a 'cult' following. The 1966 Original Cast recording, now nearly impossible to find even in rare record shops, excluded much of the show's music, due to the space limitations of vinyl LP records. A NEW CD, released in July of 2004, includes much more material than the Original Cast Album (over a full hour of music). This site offers information for those already familiar with this very special musical, as well as an introduction to several generations of newer theater-goers. The complete piano-vocal score had not been available for purchase until its recent publication (2011). This score is the complete musical, containing every song, every note found in the piano conductor score used in public performances. It includes the Overture, all the songs, scene changes, and miscellaneous cues. The Script contains all the song lyrics and notes by the authors. "The show is placed in the same historical period as Pride and Prejudice, and the romance contained therein is pure magic. The story all takes place at a Roadside Inn somewhere off the beaten path between Brighton and London. The characters are: the Innkeeper and his Wife, a Lady and her Maid, and a Lord and his Man. The Lady is running from her no-longer-bearable tawdry existence as the Regent's mistress, her Maid is bemoaning her own loss of living 'the high life', the Lord is trying to figure if he can use this chance encounter with the Lady to curry any favor with the Regent, and the Man has a secret past. All is not as it seems. There are romantic entanglements made and broken. And... True. Love. Triumphs. "It's a wonderfully heartwarming show. Fairly easy to stage. With a musical score (sold separately) that is "to die for." It's a magical musical miracle that I heartily recommend to all. (Wouldn't it be nice if we could persuade someone to film a version for BBC or PBS? Then we could buy the DVD!)" Audiences raved. This was a great event. Producers are being contacted. New York theatrical VIPs were invited to see this Special Performance of the show, which featured some major Broadway names in the cast and the original instrumentation. Producers, both those who attended and those who could not, are being contacted. CONTRIBUTIONS to this effort are welcome!